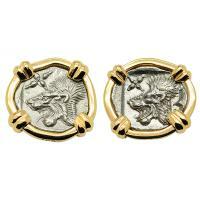 Greek 450-400 BC, Lion and boar hemiobols in 14k gold earrings. 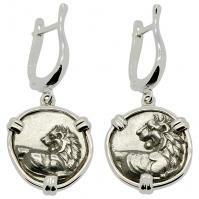 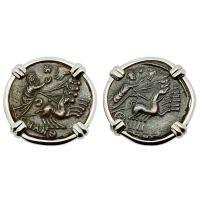 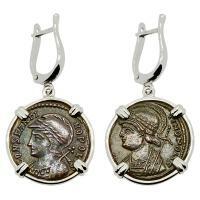 Greek 386-338 BC, Lion hemidrachms in 14k white gold earrings. 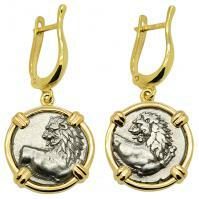 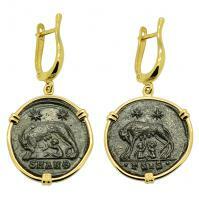 Greek 386-338 BC, Lion hemidrachms in 14k gold earrings. 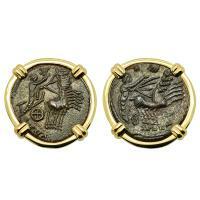 Greek 340-170 BC, Nymph Histiaia tetrobols in 14k gold earrings. 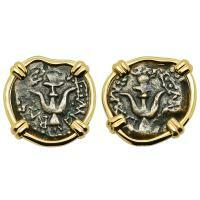 Greek 400-350 BC, Gorgon & Anchor diobols in 14k gold earrings. 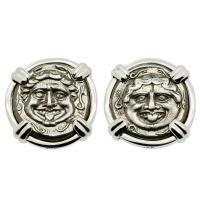 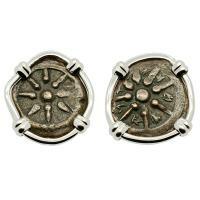 Greek 350-300 BC, Gorgon & Bull hemidrachms in 14k white gold earrings. 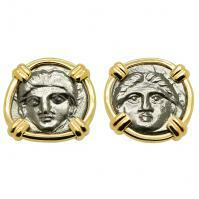 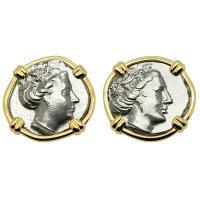 Greek 35-12 BC, King Azes II & Zeus drachms in 14k gold earrings. 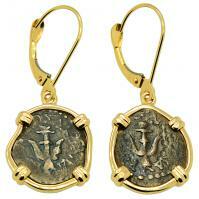 Holy Land 103-76 BC, Biblical Widow’s Mites in 14k gold earrings. 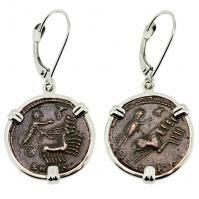 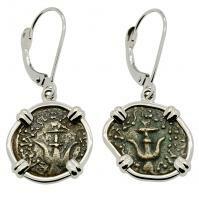 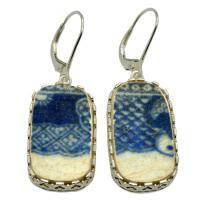 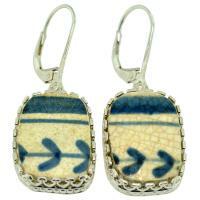 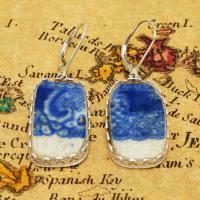 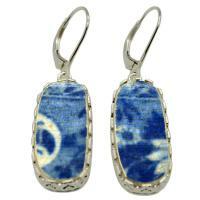 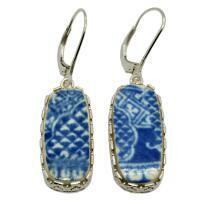 Holy Land 103-76 BC, Biblical Widow’s Mites in 14k white gold earrings. 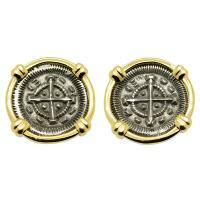 Hungarian 1131-1141, King Bela II Crusader Cross denar in 14k gold earrings. 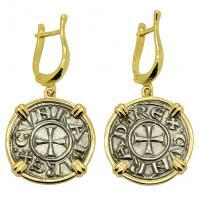 Hungarian 1131-1141, King Bela II Crusader Cross denar in 14k white gold earrings. 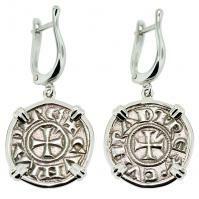 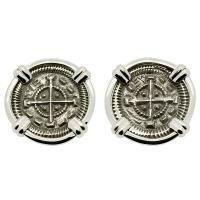 Italian 1139-1252, Crusader Cross denaro in 14k white gold earrings. 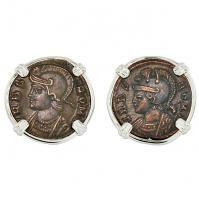 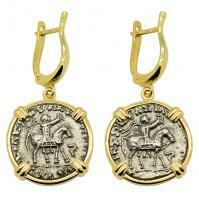 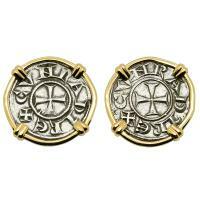 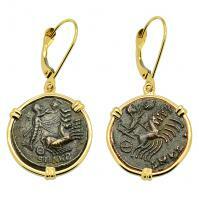 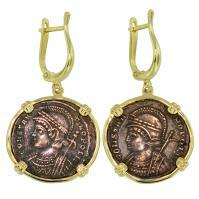 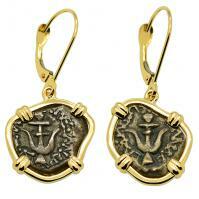 Italian 1139-1252, Crusader Cross denaro in 14k gold earrings. 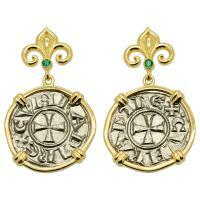 Italian 1139-1252, Crusader Cross denaro in 14k gold earrings with emeralds. 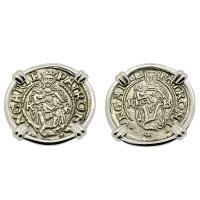 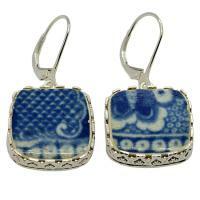 Hungarian dated 1536 & 1548, Madonna and Child denar in 14k white gold earrings. 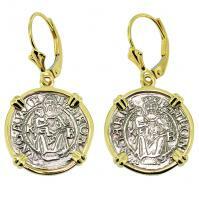 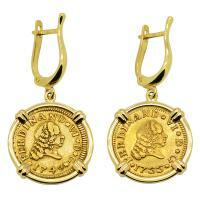 Hungarian dated 1548 & 1550, Madonna and Child denar in 14k gold earrings. 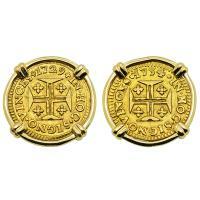 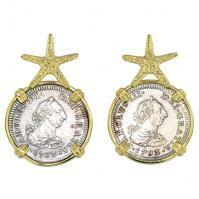 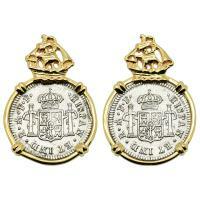 Portuguese 400 Reis dated 1729 & 1734 with cross and crown in 14k gold earrings. 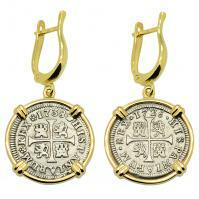 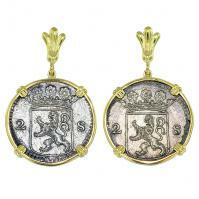 Dutch 2 stuivers dated 1724 in 14k gold earrings, 1725 East Indiaman Shipwreck Norway.